Have you just about given up on what’s felt like a never-ending quest for cheap calls to Edinburgh? We completely understand how you feel, and that’s why we created a calling plan for people like you. It’s called Vonage World®, and it’s a real game changer for anyone who needs to reach Scotland on a regular basis. With Vonage World, unlimited¹ calling to Scotland will become a reality from day one. Once you sign up, you’ll receive a Vonage Box™ that you’ll then need to connect to your high-speed Internet connection. Calling Edinburgh from USA only costs one low monthly fee. You’ll be able to make unlimited¹ calls to landlines anywhere in Edinburgh any time you choose, and reach Edinburgh cell phones for just a low per-minute rate. 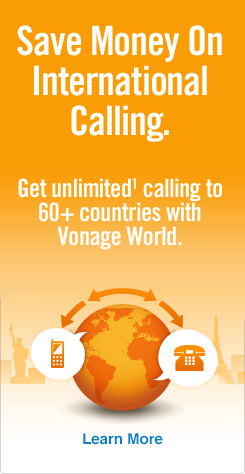 Vonage World also provides unlimited¹ calling to landlines in over 60 countries and mobiles in more than 10 countries. So obviously you want to dial Edinburgh, but do you actually know how to call Edinburgh? If not, we can help. Then, dial 131 — the Edinburgh area code (landlines only*). Finish dialing with the local 7-digit Edinburgh phone number. *Cell phone dialing is slightly differently than for a landline. Dial the US/Canada exit code, then the UK country code, and finally a “7” followed by the 9-digit mobile number. Of course, if you know people in Scotland, it’s entirely possible you have many other contacts scattered throughout the rest of the UK too. If that’s the case, check out this how to call the UK from the US guide we made for you. So that’s the deal on the cheapest way to call Edinburgh, but the real spellbinding stuff hits you when you start digging into Scotland’s past and present. Besides being the capital of Scotland, Edinburgh played a large role in the Enlightenment, and today is the site of the world’s most famous performing arts festival, the Edinburgh Fringe Festival. The city is also one of Europe’s main economic engines, with deep ties to the banking and insurance industries. The old and the new live side by side in Edinburgh…literally. Grab a quick pint and then maybe walk from Old Town to New Town. It won’t take too long, and there are numerous sites and events to experience along the way. Good “loch” with your next trip to Edinburgh!